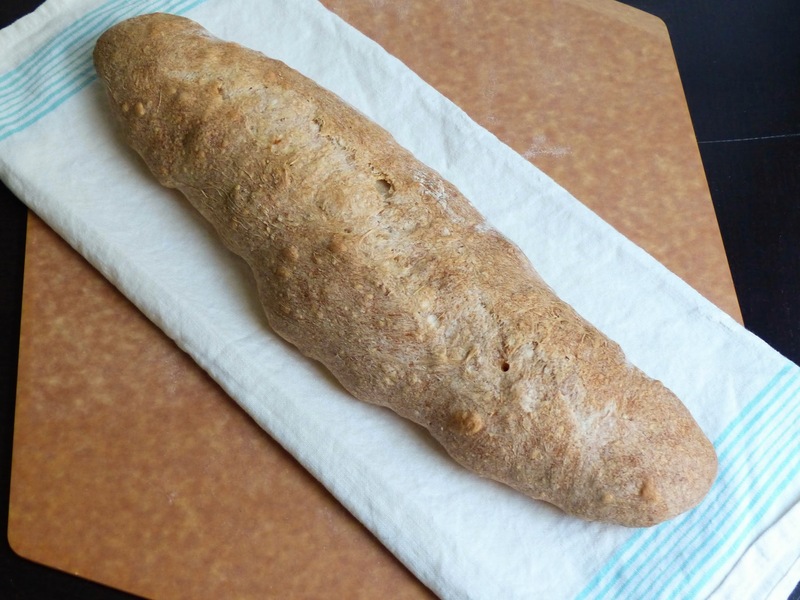 I was anxious about starting to make breads, since it's something I haven't done much of. And using the breadmaker I got at my bridal shower doesn't count. I read the beginning of the chapter at least a dozen times, to make sure I didn't miss anything. Getting all the supplies was essential, and I went to 3 different stores plus ordered online to get it all. Pizza stone, pizza peel, plastic bin, bowl scraper, hotel pan, rocks, chain and super soaker. Whew! I made my husband come with me to the hardware store to get the rocks, because I have no clue about these things. I mean, we live in an apartment in the city. Why would I ever need to go to a store for people with houses and yards? So we found some rocks, but they came in a huge bag, probably close to 50 pounds, way more than I'd need. And they were dirty. So I spent the better part of the afternoon washing and scrubbing rocks in my bathtub. I still have 2/3 of a bag of rocks in my garage. Once I had everything set up, it was time to make dough. The poolish was easy, I was used to that from making croissants. The next day I was ready to go. I re-read the recipe again and got started. Mixing the dough was no problem, it was very wet, but that's what the book said it would be. When it came to the fermentation stage I ran into trouble. The dough was so wet and sticky I couldn't touch it or move it without it getting all over everything. I know it's supposed to be a loose dough but I think it was too wet, it was nearly impossible to work with. I ended up dousing it with flour at every fold just so I could get it off the board. I followed the directions for the folds, doing the best I could with the super sticky dough. I set the timer promptly each time and preheated the oven for 2 hours. The shaping was difficult, but by the final shape I had added enough flour to make the dough workable. I wasn't sure exactly how long to make the bâtards, so I tried to go just by diameter of the center. I made them too long because when I went to transfer them to the pizza peel the ends flopped off. Moving them was difficult too. The book says to use the linen, but it doesn't say how. So I just did the best I could. Then, moving the dough from the peel to the stone was nearly impossible. The first one slumped over on itself and got all mangled up, but the second one I managed to get on there in better shape. Now for the fun part: using the super soaker! I had bought a small one, since I don't really have any space to store it. Should have gotten the bigger one. I sprayed the rocks, and steam immediately billowed up, but it wasn't enough. I have to pump the gun every time I pull the trigger, and the stream of water just isn't enough to create the amount of steam needed. So I just gave it a few extra sprays and closed the oven door, hoping for the best. After the timer went off, and I could smell the delicious bread aroma, I ventured a peek. The bâtards weren't pretty looking, and one was all mangled up, but they were done. They didn't have the pretty brown crust that I expected. Possible because I used too much flour shaping them? So I let them cool, and when I finally cut into one, I was pleasantly surprised! 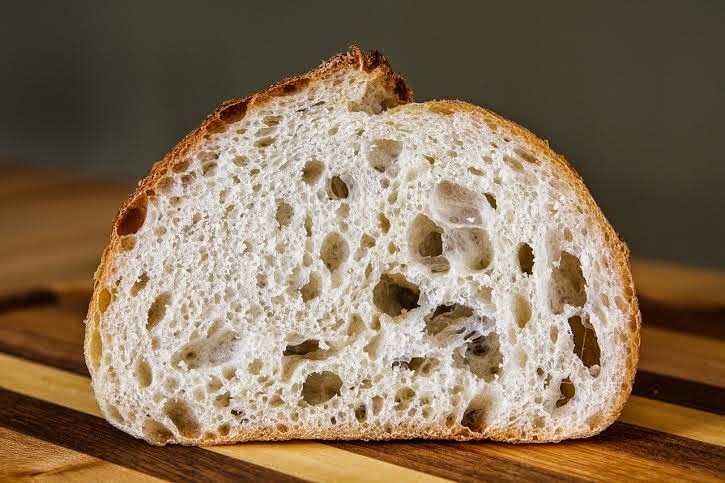 The crust was crisp and thin, the interior was soft and had only one or two medium air holes, with lots more smaller ones. After a bite, the ugliness of the exterior didn't matter. It was super tasty! Hard to believe I made it! I immediately cut a few more slices and slathered them in butter. 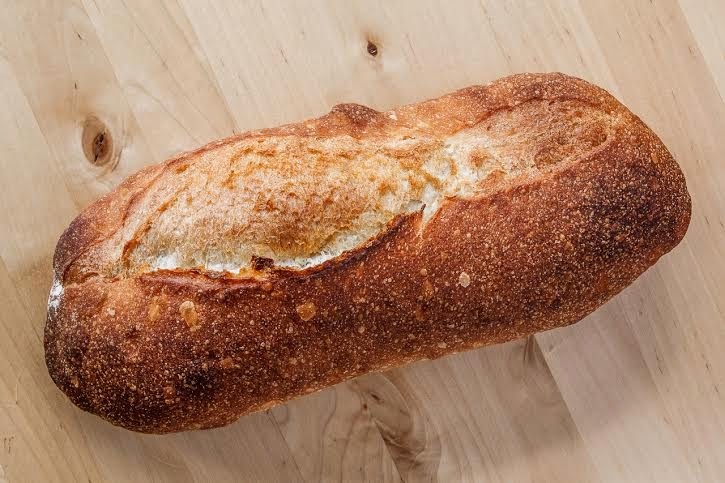 The bread didn't have a lot of flavor, but it would be the perfect vehicle for some Brie and prosciutto. I also like that the recipe makes two bâtards, so I can eat one right away and freeze the other for later. I reviewed the recipe again after I was all done, to make sure I did everything correctly. I think I missed a fold, and one hour of fermentation time. According to the schedule in the book, if you start mixing at 10am you should have bread finished by 4pm, but I started at 10 and had bread at 3. So I'll definitely try this recipe again soon. I need more practice shaping, and I'll use less water next time. 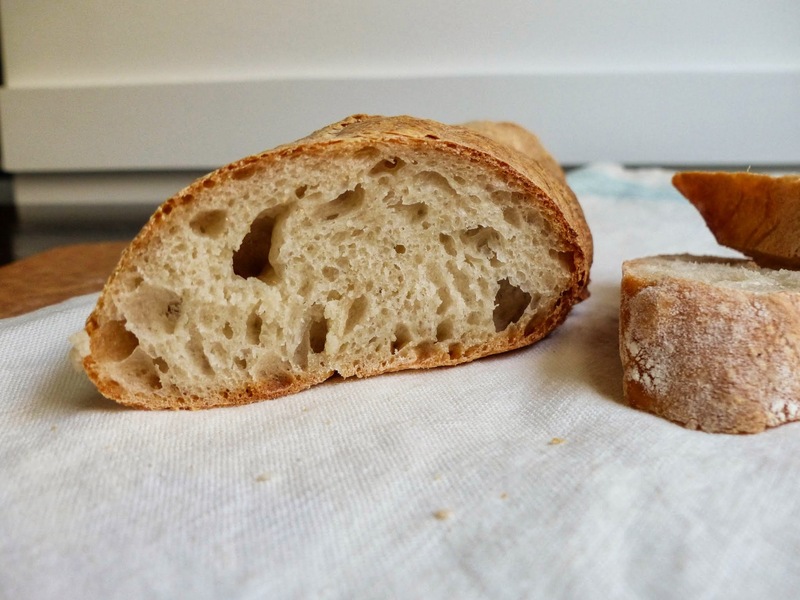 Overall, it's a lot of prep, and I'm not satisfied with the feel of the dough or the look of the final result, but after a little practice, I'm confident I can produce a delicious loaf of bread at home, for when I can't make it up to Bouchon Bakery myself. UPDATE: I made this recipe again today, making sure to keep track of the time. And I was right before, I missed one fold and one hour of fermentation last time. I also omitted a bit of the water from the recipe, about 2 tablespoons. The dough was much much easier to work with! I was able to fold and shape it much better, using more flour to keep it from sticking. I also didn't make the bâtards as long, so they were easier to get on the peel and baking stone. I devised a better water delivery system as well, using a squeeze bottle and the super soaker gun at the same time, with the help of my husband. It generated a lot more steam than before! While the bread was baking, it smelled more bread-y and yeast-y than last time. And when they came out of the oven, success! Brown and beautiful and crusty and light and just like they're supposed to look! I can't tell you how pleased I was that I was able to fix my earlier mistake. Now I'm confident that I can bake any of the breads in the chapter. My background in bread baking for a home cook is fairly good. I have been baking bread my whole life. My mom baked bread and I learned the basics from her. 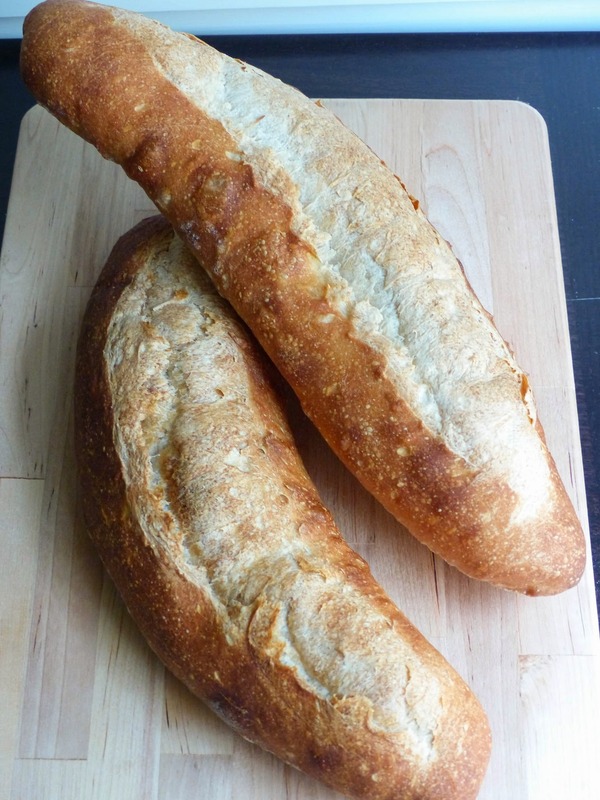 As I got interested in rustic breads and sourdough I found Peter Reinhart. 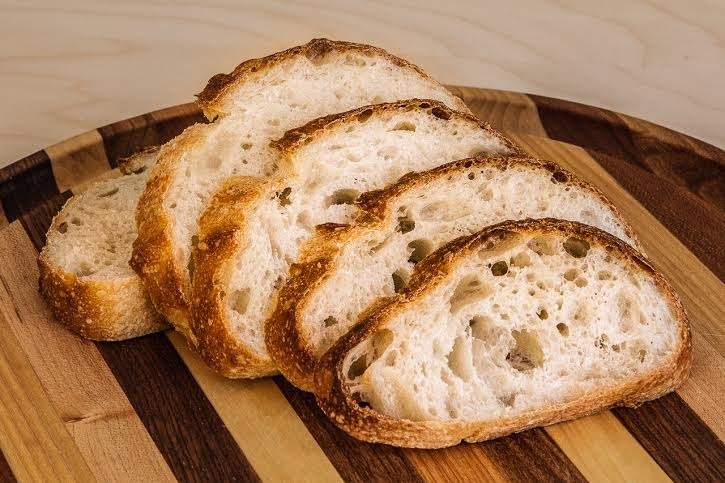 Now I just enjoy exploring all new bread recipes as I feel quite comfortable with bread and love the feel and smell of the dough. I do have my favorite recipes, but I hate getting stuck in a rut making the same thing all the time so here I am trying out some new ones!! Being quite happy with the results that I have gotten in the past with Peter Reinhart's rustic breads I felt a bit apprehensive about these breads as the techniques are different. I have to say that in the end I was quite happy with the results. The large holes are lovely in this dough and it was quite simple to make. My only critique is that it is a bit time consuming in that you actually have to be around to do all the folding each hour. It would be nice if I could just leave the dough for three hours and go work in the garden or run to the store. I might try that, just to see what results I get. In regards to the steaming method with river rock and chain. I did not do this. At first I thought I would, because I am always looking for ways to get more steam but in the end it just seemed like too much work. I use a pizza stone and below that, for steam, I use a cast iron pan that I pour hot water into at the beginning of the bake time. It is a bit tricky to pour and not scald yourself at the same time, but I use a thick oven mit and have not been burned yet. When it comes to proofing the shaped loaves I just shape them and put them on a baking sheet (which I use as a peel) that is covered with parchment. 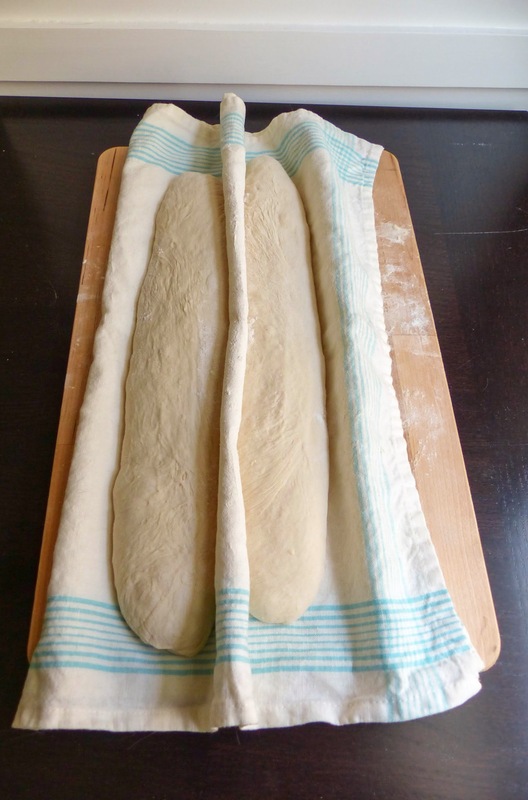 I don’t have the linen cloth and I don’t feel like I have needed it, as my loaves seem to keep their shape just fine on the parchment covered baking sheet. I then spray them lightly with oil and cover them lightly with cling wrap. 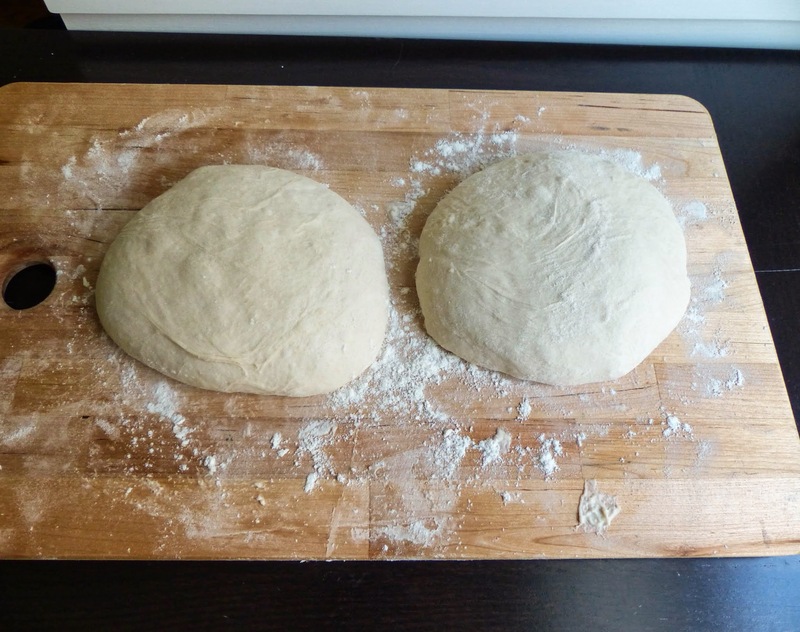 When it comes time to bake them I slide the dough AND parchment onto the pizza stone and bake them just like that.